Read more: Jesus is our Savior, why give Our Lady all this attention? We know very little about the secrets of Medjugorje. First, Our has Lady allowed the third secret to be known, which is: There will a permanent, indestructable, supernatural sign left at the place of Our Lady's first apparition in Medjugorje on the hill Podbrdo at the conclusion of the apparitions. Read more: What are contained in the "secrets" that Our Lady has given the visionaries? Read more: What is fasting? How do you fast? What did Our Lady ask in Medjugorje? What does that mean – Her preference? Read more: What does that mean – Her preference? It is important to first understand that the Church will not continue its investigation of Medjugorje until the apparitions of Our Lady are complete. 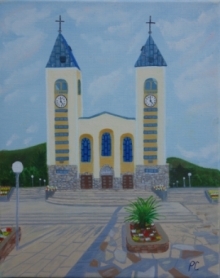 But the last official statement by the commission of bishops set up to investigate Medjugorje declared in 1993: "We bishops, after a three-year-long commission study accept Medjugorje as a holy place, as a shrine. Read more: Why believe in Medjugorje if the Church hasn't approved it yet? Why did Our Lady choose Medjugorje?